Super Mario World, Starfox and Yoshi's Island are set to be re-released later this year as part of a new classic SNES console. The original Super Nintendo Entertainment System, launched in 1990, sold 50 million units worldwide. The SNES Classic follows the NES Classic, which went on sale late last year but abruptly discontinued in April - much to the frustration of fans. 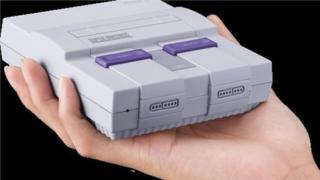 Nintendo said limited resources were to blame, but insisted it would not make the same error with the SNES. "We aren't providing specific numbers, but we will produce significantly more units of Super NES Classic Edition than we did of NES Classic Edition," a Nintendo spokesperson said. The assertion follows accusations from the gaming community that Nintendo was engaging in so-called intentional scarcity. The marketing ploy was supposedly intended to drum up publicity for the Japanese company, which launched its flagship new console, the Nintendo Switch, earlier this year. One industry watcher said it was notable that the firm had decided to release new hardware rather than release its old games as apps for smartphones and tablets. "Nintendo still has the view that it likes to control the whole experience," commented Piers Harding-Rolls from the IHS Technology consultancy. "Conceivably in the future it could release some of these titles for smartphones, but I think it's quite unlikely as these games weren't built for mobile devices." He added that the firm's mobile strategy currently appears to be focused on in-app payments, which would not fit the selected titles' designs. Nintendo would not confirm if it intended to keep making the SNES Classic beyond the end of 2017. "Super Nintendo Entertainment System: Super NES Classic Edition is currently planned to ship from Sept. 29 until the end of calendar year 2017," the company added. "Our long-term efforts are focused on delivering great games for the Nintendo Switch system and continuing to build momentum for that platform, as well as serving the more than 63 million owners of Nintendo 3DS family systems. "We are offering Super Nintendo Entertainment System: Super NES Classic Edition in special recognition of the fans who show tremendous interest our classic content." As well as the classic titles, Nintendo will also bundle in a game from the SNES era that was never actually released - Star Fox 2. The console will cost $79 in US, and £79.99 in the UK. Other firms are also looking to capitalise on yesteryear gaming success. Sega, whose Megadrive console competed fiercely with the SNES in the Nineties, recently said it would re-release a huge library of games as part of a Netflix-style scheme. The games have advertising unless a user pays a one-off $1.99 fee. For some time, fans of old games have been creating game ROMs - read-only memory - that emulated the old titles so they could be played on a modern PC or other device. However, ROMs are often fraught with bugs, and as games increased in sophistication became harder to reproduce. They were also, of course, illegal - though there are few cases of game companies going after ROM fanatics, although some websites distributing the software have faced legal action.